City Manager Wally Bobkiewicz speaks at a City Council meeting. 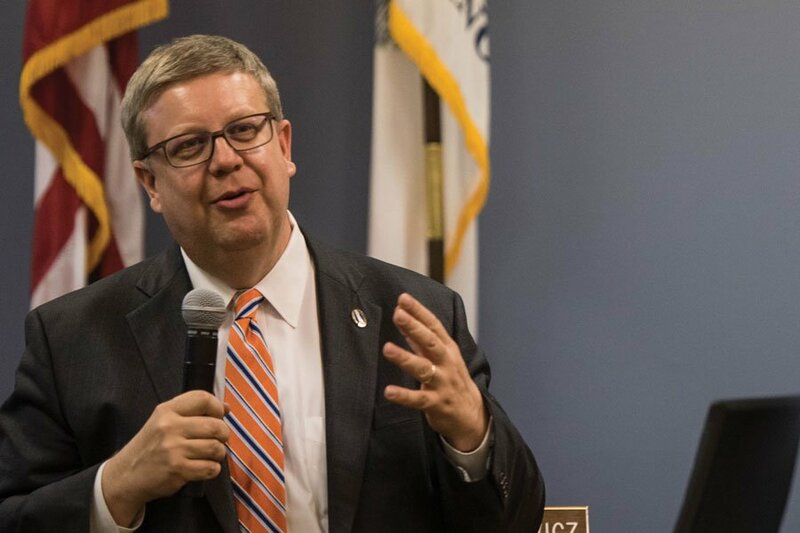 Aldermen on Monday authorized Bobkiewicz to restart negotiations over the possible sale of a city-owned parking lot near the Evanston Public Library. Aldermen voted to reopen talks over the possible sale of a parking lot located next to the Evanston Public Library. In its final meeting, the 79th City Council voted 6-2 on Monday to authorize city manager Wally Bobkiewicz to restart negotiations with developers over the possible sale of the city-owned parking lot on Chicago Avenue — known as the “library parking lot.” Officials last month declined to allow Bobkiewicz to negotiate the construction of an 11-story office building for the site. Residents and several aldermen have previously expressed concerns over the proposed sale of the lot and how it could impact the historical character of the area, which includes buildings related to women’s history. The lot is located between the Frances Willard House, 1730 Chicago Ave., and the Women’s Club of Evanston building, 1702 Chicago Ave. The parking lot is 32,000 square feet and has 74 parking spaces. The deal to build the office building that alderman rejected last month had a set sale price of $4 million. Several residents reiterated concerns Monday that the sale of the lot could hurt the area’s character. Janet Steidl, a resident who volunteers as a restoration designer for the Frances Willard Historical Association, said the Frances Willard House is a National Historic Landmark, and a new office building would harm the historic vibrancy of the area. “This should not be how Evanston views its stewardship of arguably its most significant historic site,” Steidl said. Vickie Burke, president of the Frances Willard Historical Association, said she was “a bit disturbed” at how aldermen had rejected the negotiation of a deal in April only to change their minds on Monday. In response to the concerns, Ald. Donald Wilson (4th) clarified that aldermen had only authorized negotiations for a possible sale of the parking lot — the first step in a two-part process. The second step would involve a City Council vote on any proposal put forward from the negotiations. “This is a negotiation, and it’s not a done deal,” Wilson said. Ald. Ann Rainey (8th), who voted against the motion, disagreed with Wilson’s comments. Rainey said her years of experience on City Council have taught her that the proposed office building for the parking lot will likely get built anyway. Aldermen also delayed a vote Monday of a planned development at 831 Emerson St.
Members of the new City Council — who were sworn in Monday — will vote on the plan at a meeting June 12. The proposed 9-story, 242-unit residential building would include 3,300 square-feet of ground floor commercial space and 174 parking spaces on site. Members of the community, including several residents of the Sherman Garden Apartments located near the proposed site on Emerson Street, have previously voiced their concerns about the building’s height and its lack of contribution to affordable housing. The developers — Focus Development, Inc. and CA Ventures — have said they will contribute $2.4 million to the city’s Affordable Housing Fund.